This architecturally designed Sydney penthouse epitomises luxury and refined elegance of the highest level. As a global finalist in the Sub-Zero & Wolf kitchen design awards 2017, optimum quality was an intrinsic factor. 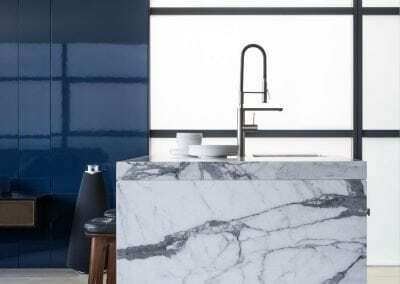 Bringing this design brief to life involved using Statuario marble for the kitchen island and splashback and continuing the theme for the bathroom vanity, niche shelf and splashback.